How Do Polar Bears Hunt Seals? Not only do polar bears navigate through the arctic habitat on their own they also smell food from a mile away. 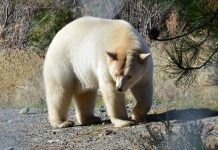 The unique ability to smell prey (hidden 3 feet under the snow) allows polar bear to survive in the world’s most inhospitable environment. Clearly most other carnivores let alone bears would give up hunting in the Arctic habitat. This is what makes polar bears an apex predator in the arctic marine ecosystem. Polar bears possess many characteristic adaptations that make them rather deadly predator in the arctic ecosystem. 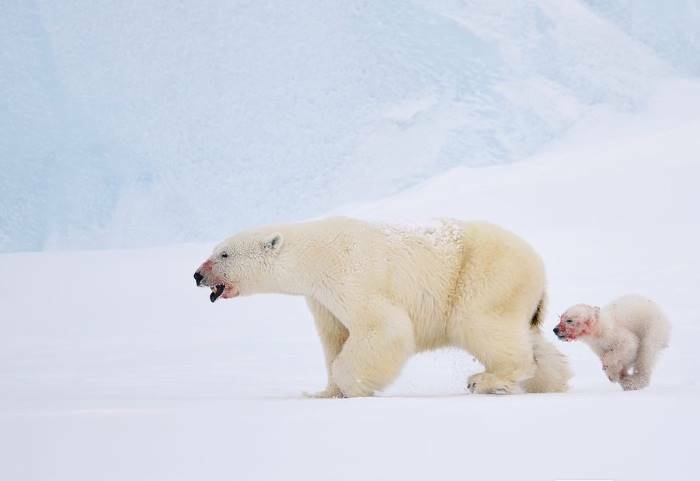 The unique hunting strategies, acute sense of smell, powerful long teeth adapted to chewing and crushing seal’s head, exceptional strength, good eyesight, and remarkable hearing—all combine to form formidable polar bears. In the Arctic Circle polar bears rely on seals for nutrition and why wouldn’t they? There are millions of seals living in the Arctic waters and when they emerge to the surface they become polar bear’s primary prey. Seals come to the surface for two reasons; one is to breathe and the other reason is to relax on the ice float. Polar bears must go after their prey during these times with no exception. Seals come to the surface for two reasons; one is to breathe and the other reason is to relax on the ice float. Polar bears must go after their prey during these times with no exception. Seals are the important prey of arctic bears—they love to eat seals all day long. However eating a seal and hunting a seal are two different things. Hunting an animal such as seal is challenging because seals possess equally good sense of smell. 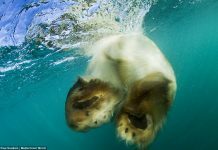 As the bear approaches the seal’s hole it (the seal) dives down into the water and escapes. It happens quite often and many polar bear’s attempts go in vain. But there are methods in the polar bear’s attempts. These methods are called polar bear’s hunting methods. Polar bears likely consume ringed seals (including pups) more readily as compared to bearded seals. They are thought to hunt in the direction of the wind precisely because bears sniff out all along on the sea ice. April is the ideal month when bear must look out ringed seal’s pups. Polar bears crush and eat the head of a pup if she is too hungry else the bear just leaves the head. The still-hunting is probably the most familiar and effective hunting method of polar bears. In this method bears rely on their acute sense of smell to search seal breathing hole. The still-hunting is probably the most familiar and effective hunting method of polar bears. In this method bears rely on their acute sense of smell to search seal breathing hole. The breathing hole is a point where seals show up for breathing. 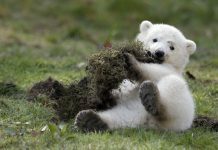 The white bear will crouch in close proximity to the hole as close as she possibly can. It does so without making sound. If the seal doesn’t show for hours the polar bear waits for hours. The predator remains calm, silent, and motionless all during this time. She is a patient hunter. 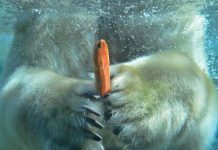 When the right moment arrives and the bear smells a seal exhaling in its hole she (bear) smashes the ice with her forepaw and pull the seal onto the surface. Now the polar bear will crush the seal’s head and eat it later. Yet another polar bear’s hunting method is stalking. Just like land mammals polar bears stalk seals when they (seals) relax on the sea ice. The bear attempts to reach within 100 yards closer to the prey without getting noticed. If the seal remains unaware the bear inches to within 40 feet of the prey and then it sprints towards the seal for the final attempt. Bears rush for the final attempt when seals show its head again to scan the area. If the seal remains unaware the bear inches to within 40 feet of the prey and then it sprints towards the seal for the final attempt. 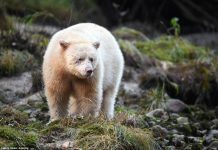 In the past four years studies have photographed that adult polar bears catch and pursue lesser snow geese on land in the mid-summer. 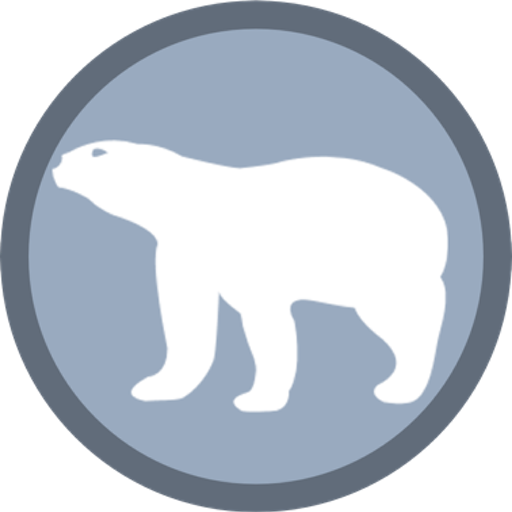 This shows a partly change not only in polar bear’s diet but also in her hunting techniques. Stalking has long proved to be useful for polar bears probably because they camouflage themselves during the hunt. Seals cannot spot bears since the bear’s white color blends with the arctic sea ice. As it turns out polar bears go unnoticed even when they get 5 – 10 meters close to the prey. 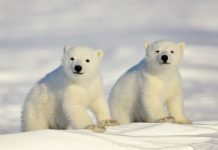 Do Polar Bears have Webbed Feet? What Do You Call a Baby Polar Bear? What Do Polar Bears Eat for Kids?